HAYS, Kan. – Nick Schumacher is looking forward to his final year as an undergraduate student at Fort Hays State University. During his “super senior” year – his fifth at FHSU – the Hays native will serve as one of the drum majors for the Tiger Marching Band for home football games. First, though, he put in a week of work at what could be his final year at the summer High Plains Music Camp on campus. For the first time ever, Schumacher got to play with the camp faculty in both the tuba quartet and the trombone choir performances. As early as his sophomore year at Thomas More Prep-Marian High School in Hays, Schumacher had begun working with Fort Hays State faculty, taking lessons from Dr. Lane Weaver, then assistant professor of music and theater and director of the FHSU Marching Band. After graduating from TMP in 2014, Schumacher decided to stay close to home to attend college – partly because of finances, partly because of familiarity. After all, he had been coming to campus every summer for the music since he was in eighth grade. He also participated in numerous activities during the school year, playing in the pep and marching bands, symphonic winds and wind ensemble and the jazz band. He also sang in the brass choir and served as the student conductor for the pep band at Tiger basketball games last winter. Weaver has since left FHSU, and Schumacher now studies under Dr. Peter Lillpopp, assistant professor of low brass and director of athletic bands for the Tigers. Schumacher, who writes music, would like to teach at the college level someday. “If that doesn’t work out, I could work for a publishing company,” he said. Schumacher thinks the variety of opportunities available to him at FHSU has helped build a solid foundation for whatever route he chooses. That includes the summer music camp – five years of participating as a student, followed by four as an intern and counselor. Schumacher noted other advantages of attending the music camp. That was something that hadn’t even been on his radar his seventh-grade year at Felten Middle School (now Hays Middle School). That one week in the summer of 2009 was life-changing for Schumacher. Schumacher still was unsure if he wanted to make music his career choice, until about midway through his senior year in high school. He had been planning to go into pre-physical therapy. 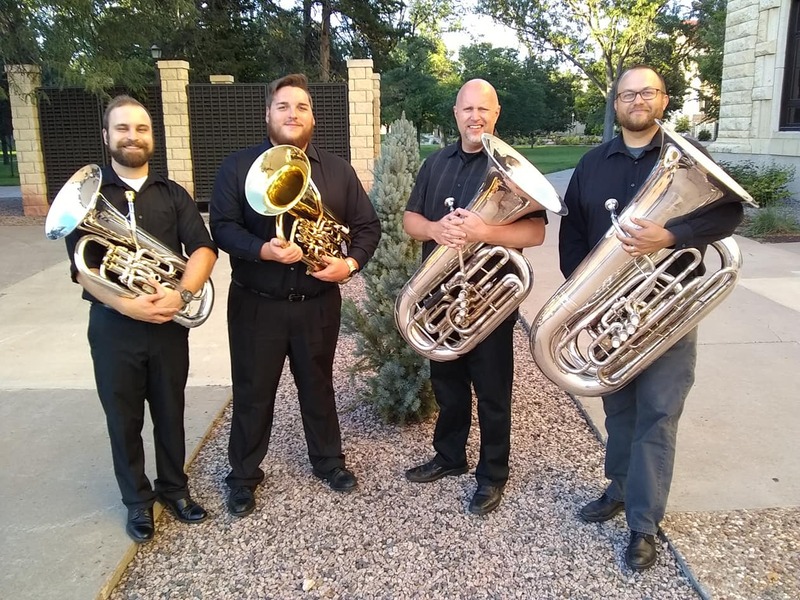 Cutline: Fort Hays State University senior Nick Schumacher, second from left, shown with members of the faculty tuba quartet at this summer's High Plains Music Camp at FHSU – from left Steven Rathert, Osage City; Dr. Peter Lillpopp, FHSU; and Steve Novotny, Pratt.